Wood windows are a traditional choice for many homeowners, and are often what comes to mind when you think of windows in most homes. If you’re looking to install or replace wood windows in Natick, or are trying to decide what window material is right for you, it’s important to consider the various features that wood windows have to offer. Natick Window Company provides a wide array of wood window options, for window installations and window replacements. In addition to our exceptional products, Natick Window Company is pleased to offer Natick, MA and the surrounding communities with an outstanding staff of technicians who are here to answer your questions, and help you to find the best and most sensible window to suit your needs. 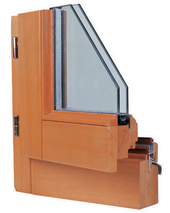 Wood windows offer superior insulation. Unlike some other window materials, wood contains the smallest coefficient when it comes to expansion. This makes the wood secure and stationary, which also means that you are able to choose from a variety of designs. Unlike other materials, wood windows are less sensitive to changes in temperature. This helps the wood to “breathe” which allows it to keep its shape and keeps the humidity level normal in your home or business space, creating an optimum level of comfort. There are a variety of stains and lacquers available to highlight the natural beauty of wood windows, to make this both a functional and visually pleasing addition to your home or office. Wood windows do not collect electrostatic charge, and do not hold or accumulate dust as much as some other window materials may. While more maintenance and care may be required to keep your wood windows looking like new, the long-lasting quality that you will experience from this particular window material is one benefit that cannot be ignored. Resale cost is yet another benefit to wood windows. Adding beautiful, high-quality wood windows to your home can considerably add to its market value. Also, when you are looking to tie together the interior furnishings of any room in your home, adding wood windows can be a great way to help the room come together flawlessly. Maintenance is a critical part of the care and keeping of your wood windows. To prevent them from warping, rotting, or discoloring in any way, make sure to keep them clean and call Natick Window Company right away if you suspect any problem with your wood windows. Our expert staff would be more than happy to offer you some great tips and best practices for taking care of your wood windows in Natick to make sure that they look great for many years to come, and remain an important focal point in any room in your home. Natick Window Company is here to answer all of your questions about wood windows. ​Call us today at 508-251-8038 to talk with us more about bringing the natural beauty of wood windows to your home or office in the Greater Boston area! We are available for replacement wood windows, or to perform necessary wood window repairs or maintenance on your existing wood windows.